All transactions are safe and secure with a reliable history in online purchasing behind each of our associates. 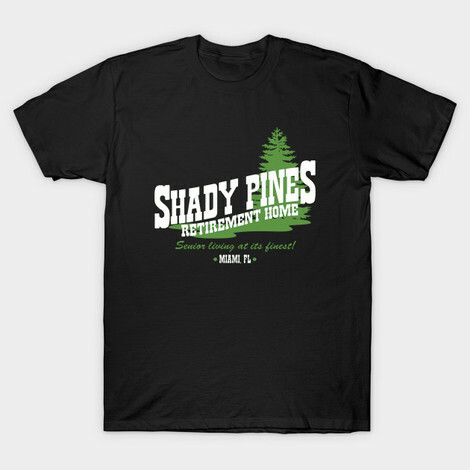 Buy the Shady Pines Retirement Home t-shirt to own Golden Girls clothing and merchandise. In case you go wandering off, this shirt will help you get back home to the Shady Pines Retirement Home. While Sophia Petrillo has spread numerous rumors about the home, including that they set off fire alarms to watch their residents scatter, they are simply not true. Remember, she is being investigated for burning the place down prior to her departure. Do not believe all that you read. Join the Shady Pines community today. Grab one of these Golden Girls t-shirts now or we will send you to Shady Pines...to be a resident. In addition to the Shady Pines Retirement Home tee above, browse the Golden Girls Clothing Gallery for more apparel like men's and women's clothes, kids shirts or hoodies.